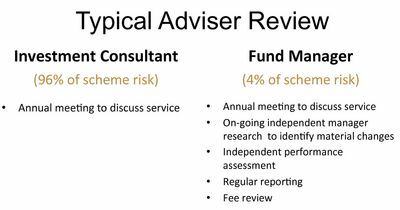 The Investment Consultant Informer is a regular report that enables trustees to monitor and review their investment consultant. The report ensures that governance of your investment consultant is of a similar standard to that of your fund managers. Good governance requires regular assessment and review of the investment consultant to ensure that there has been no significant changes at the firm which could adversely affect the service being provided. Most pension schemes hold an annual meeting with their investment consultant to review the service they have received. This provides feedback to the consultant and identifies areas where service improvements could be made. However, trustees should also be aware of other material changes at the consultant that could result in a change to their effectiveness, such as loss of key personnel, rapid loss of clients or changes in their conflicts of interest policy. The investment consultant cannot be relied on to provide this information, particularly if it is not good news! The Investment Consultant Informer Service constantly monitors investment consultants to identify significant changes and notifies you when these happen, providing feedback on their significance. As a result trustees are able to challenge their investment consultant and be confident that the advice they receive is the best available.